Today, let’s get real. As women, we carry around a lot of guilt. Maybe our homes aren’t as clean as they should be or our meals aren’t as tasty as they should be or we aren’t as put together as we should be and the list goes on and on. For starters, let’s stop “shoulding” all over ourselves. We’re doing the best we can. My house is not immaculately clean, but we’re not living in filth either. I’m a terrible cook, but Stouffer’s makes a mean lasagna so no one goes hungry. Throwing on some red lipstick is about as put together as I can get somedays. That’s all okay. 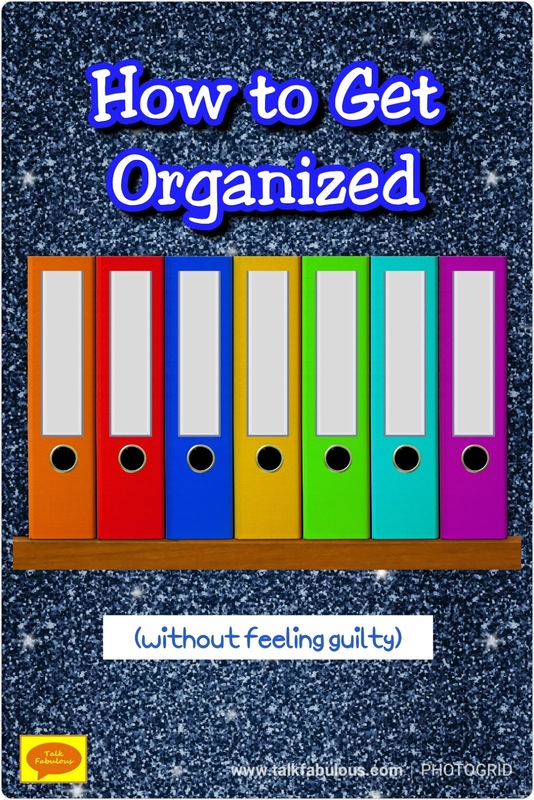 One place I really struggle with the guilt is with organization, particularly filing. 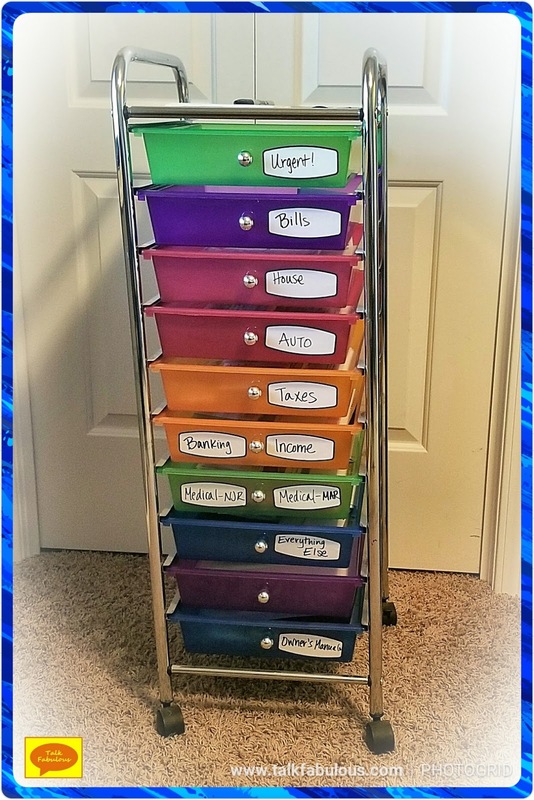 In my mind, all the files are tucked neatly in color-coded filing folders in the file cabinet we don’t own. In reality, everything that needs filing ends up in a huge stack of papers on the desk. I’m talking huge, like 2 years of papers it’s-way-too-overwhelming-to-even-think-about-doing-anything-with huge. The picture above is not far off what my desk used to look like. Sad but true facts. The hubby and I recently moved into a new house. This has forced me to take a good hard look at some organization issues, like the whole filing thing. First of all, I find it helpful to identify the ideal end result. 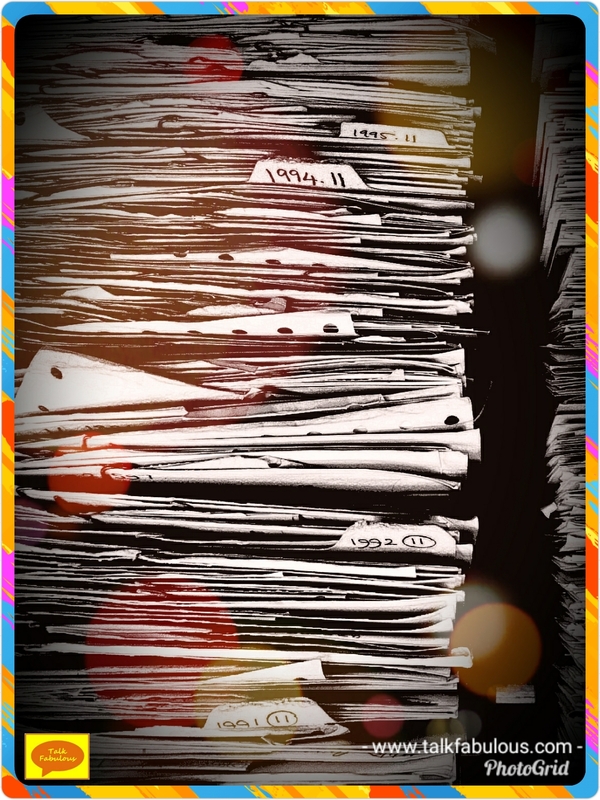 For me, that’s again all the files tucked neatly inside color-coded file folders in a filing cabinet. Next, I identify the barriers to achieving the ideal end result. In my case, that’s a couple of things. One, we no longer have a filing cabinet. Two, I don’t take the time to unfold the papers and place them into the file folders. Even when we had a file cabinet I didn’t do that. Instead, I’d just stack the papers on the desk with the intention of getting to it later (news flash: later never came). So how can I bridge the gap between my ideal and reality? Clearly, I’m not going to take the time to unfold anything so I need a system that will fit that. I also need a system that is as quick and easy as setting the files on the desk. Ideally, the system is color coded or ordered in a way that makes retrieving files simple. What’s a girl to do? Well, I emptied my craft cart and turned that into my file cabinet. The drawers were already colored, so I simply just added some labels. Now, all I have to do is open the drawer and put the folded paper inside. So easy! I managed to sort through and file my 2-year paper pile in a night! Plus, my new system is so easy I’ve filed everything immediately since then! No more endless stacks of paper cluttering up the desk! Whatever you struggle with, the bottom line is to find a system that works for YOU! Not a system that should work or works for Mrs. Jones next door, one that is just for you. You’ll start to see amazing results and the guilt will melt away. 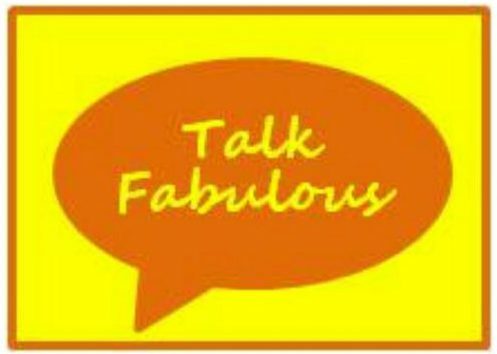 Doesn’t that sound fabulous? What organization issues do you battle? Whew, I’m late to the party on this one! 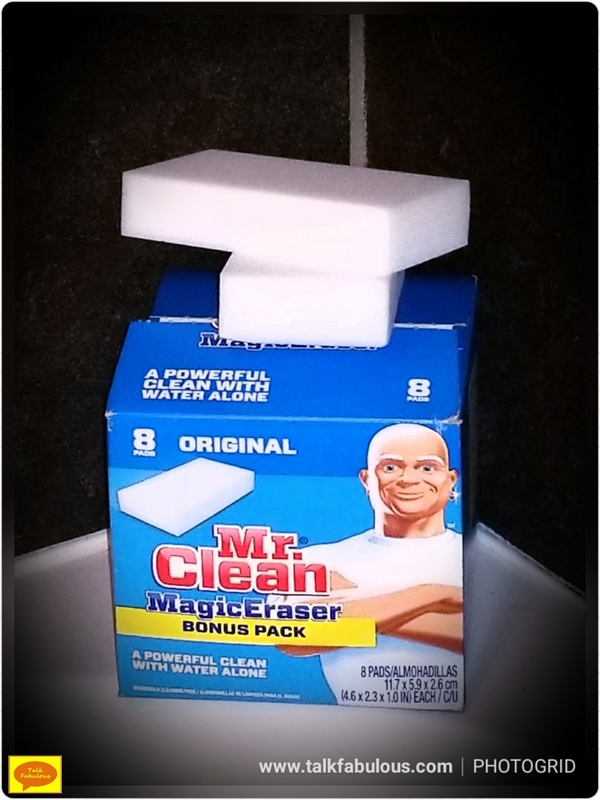 Magic erasers have been on the market for YEARS now (find them here). I’ve always been intrigued by them, but they make me nervous. What exactly is in them that enables them to erase anything and everything? Nobody knows. Do I really want to spread something all over my home that I have no idea about? Not really. However, today’s inspiration blog post finally got me to try them. How you might ask, well, let me tell you. Here’s how it went…I know I’m an adult and adults have a glass shower door instead of a shower curtain. The thing is, I despise shower doors. Seriously, they are the worst thing to clean EVER! I much prefer having a shower curtain that I can throw in the wash. 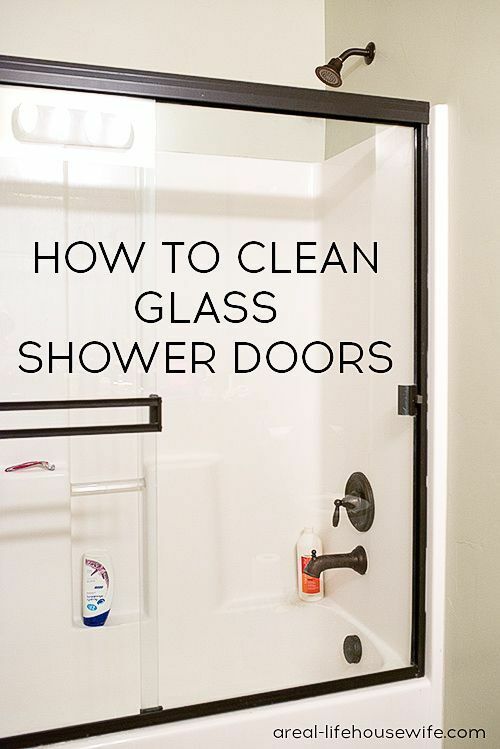 When I saw this post on Pinterest on how to clean glass shower doors, I immediately clicked on the article to see the magic secret. Turns out the magic secret is magic erasers. Fine, I’ll give in. I’m still freaked out by them, but let me tell you they work wonders. 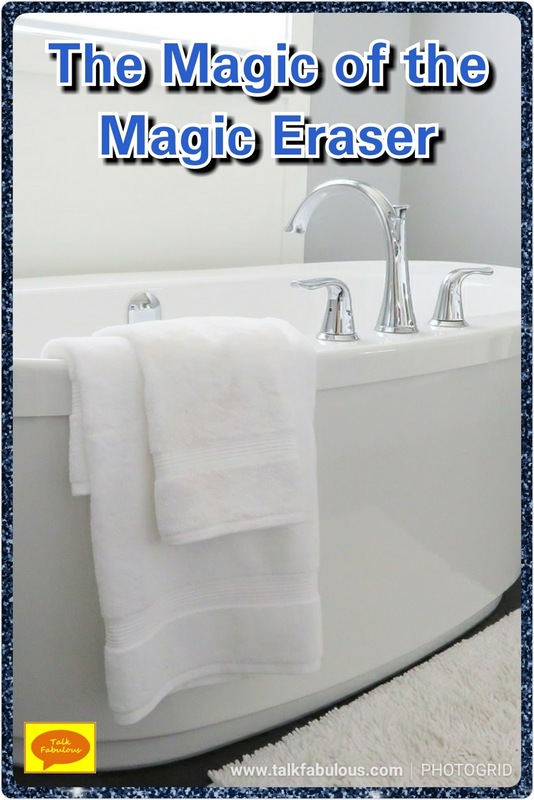 Simply get the eraser wet, squeeze out the excess water, and scrub the dirt away. I leave one in the shower so I can clean while my conditioner is doing its thing. Magical, seriously magical! If you haven’t tried these yet, I would defienetly recommend giving them a shot. You’ll be amazed! The question remains, do you prefer shower doors or shower curtains? Today, we’re trying out something new called Wacky Hack Wednesday. Each Wednesday I’ll scour Pinterest, and maybe the rest of the internet, to bring you fashion, beauty, and lifestyle ideas to make your life easier. 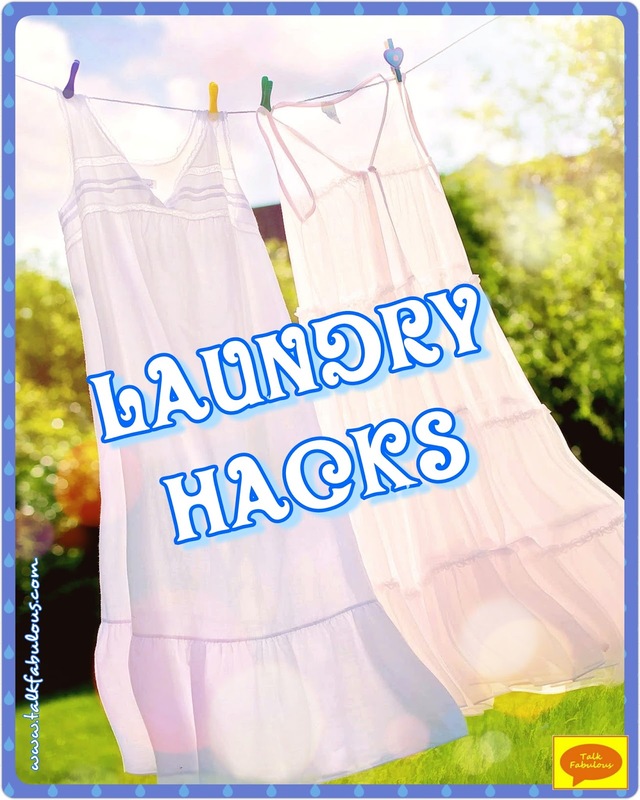 First up, let’s talk Laundry Hacks. Laundry is not super fun, especially if you have some stubborn stains on your favorite pieces. No worries, though! I’ve got you covered! Did you spill some olive oil on your shirt while you were cooking? Did some grease drip from that delicious pizza onto your pants? Oil based stains can seem impossible to remove, until now. Simply sprinkle some baking soda over the stain, rub it in, let it sit for a bit (I’ve let it sit anywhere from a few minutes to a few days and it seems to work just the same), and wash as normal. Voila! The stain is gone! Chalk also works, but I don’t have a lot of chalk laying around, so I prefer baking soda. Dry Erase Markers + Washing Machine = Genius! Ever throw something in the washer that wasn’t supposed to go in the dryer only to forget it wasn’t supposed to go in the dryer and then the item is ruined? If so, have I got a hack for you! 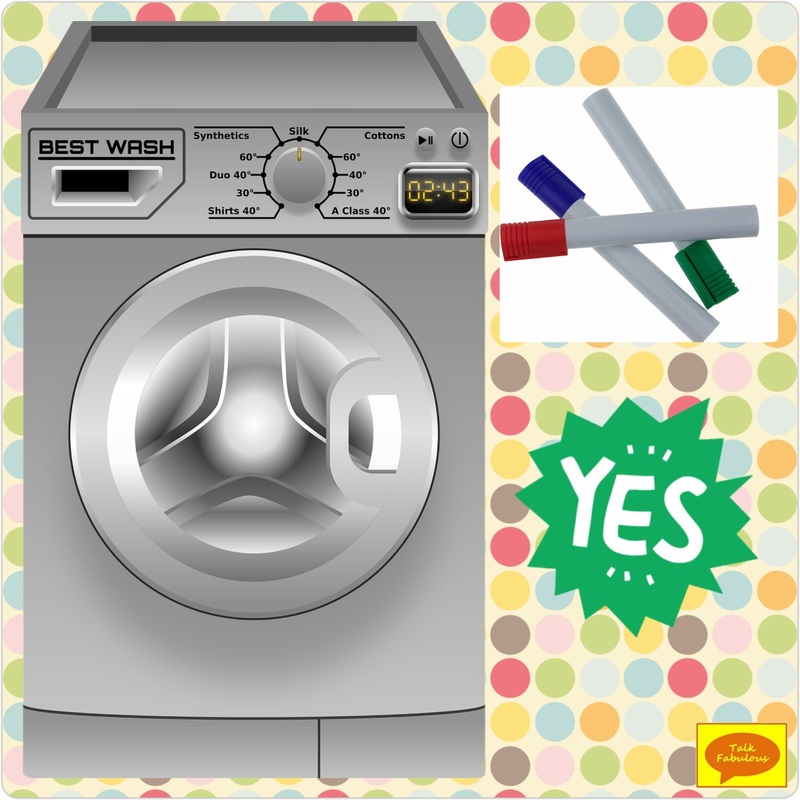 Use a dry erase marker on the washer to write down the items that don’t go in the dryer. Genius! Sometimes mystery stains appear on our clothing with no rhyme or reason. At least, not that we can comprehend. 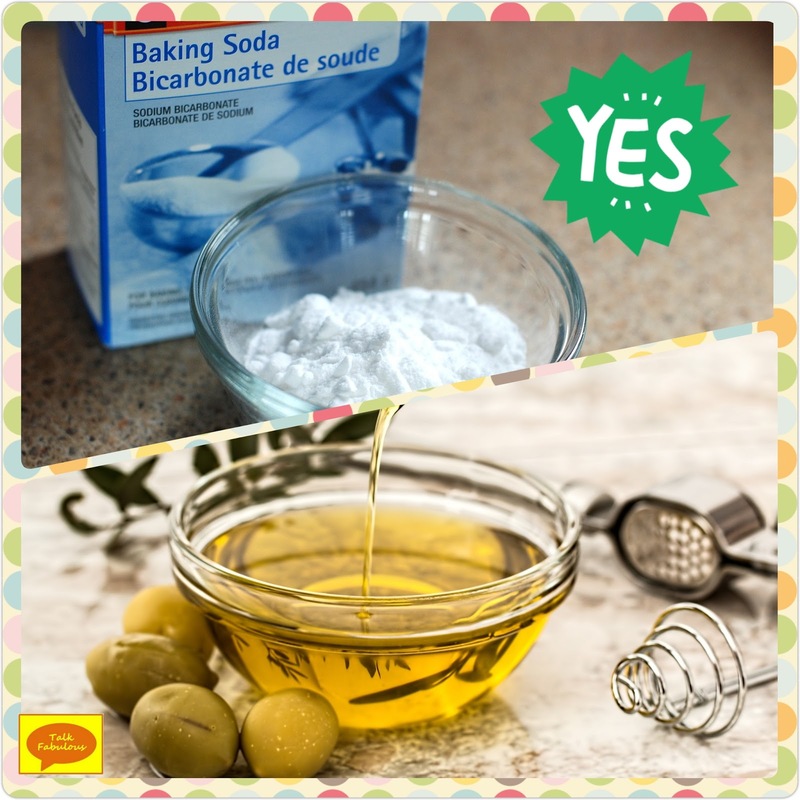 No matter, homemade “Shout” stain remover to the rescue! I never have “Shout” on hand when I need it, but I do have the ingredients to make the homemade version. 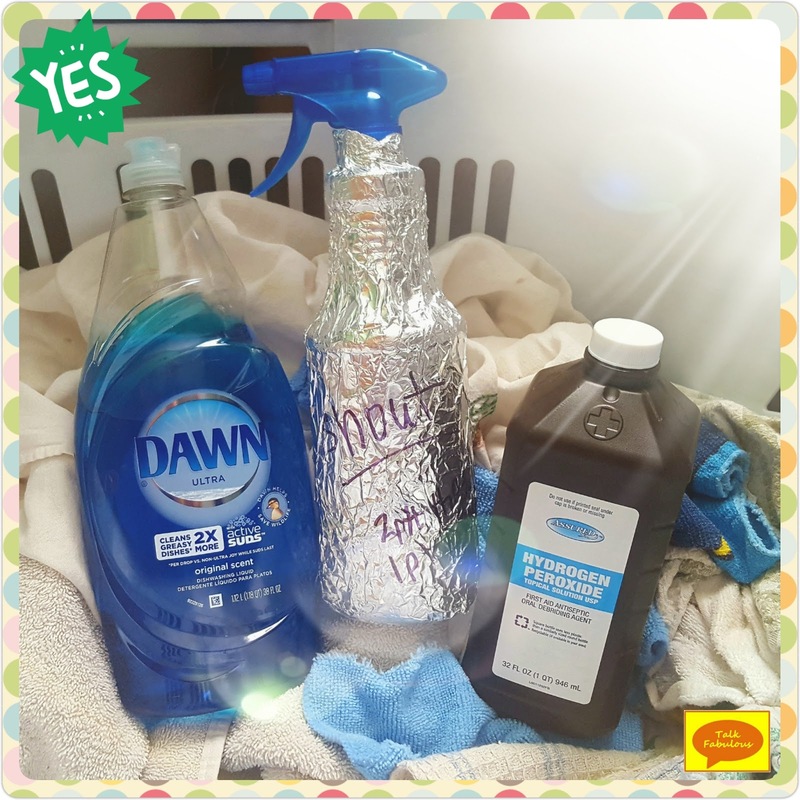 Simply mix 1 part Dawn and 2 parts hydrogen peroxide in an empty spray bottle. I wrap my bottle in aluminum foil since the hydrogen peroxide is light sensitive, but that’s optional. I’ve used this on a variety of stains and it works every time! 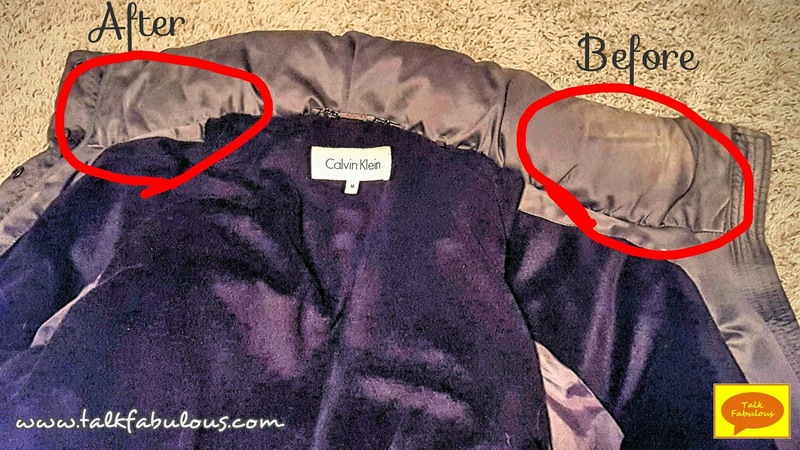 What are some of your laundry hacks? Following the inspiration photo as a guide, I set off for my local Dollar Tree store. The first thing I picked out was the caddy. My store had the choice of blue, red, or green. I opted for the green because it really does make me happy. 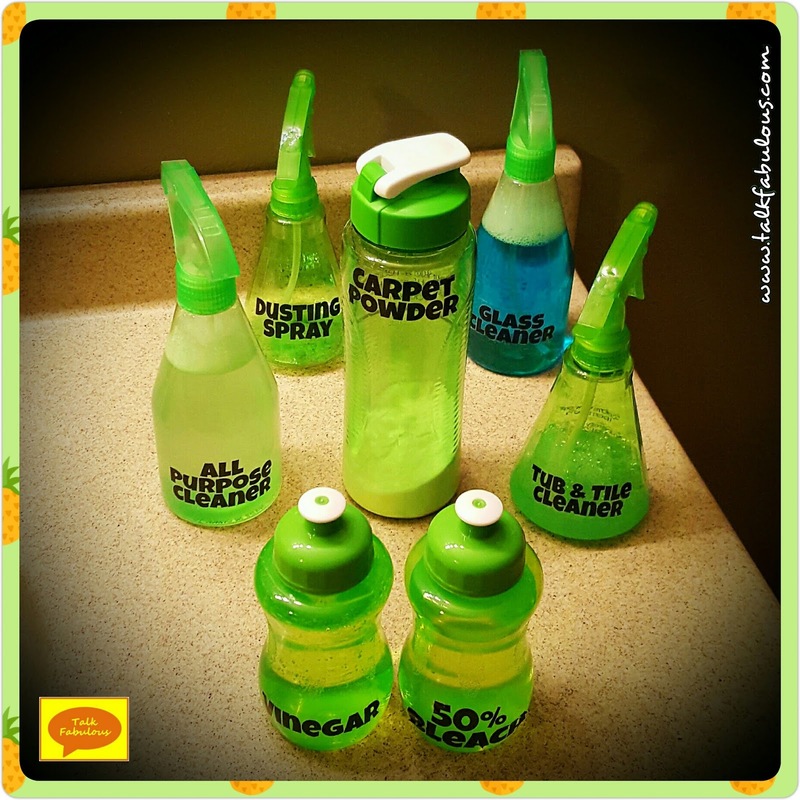 Next, I scoured the store for spray bottles, squirt bottles, cleaning cloths, scrubbers, etc. I managed to find everything I was looking for in that same green color. Don’t you just love when everything matches? That makes me happy too. To top everything off, I made some cute labels following the instructions here. With that, my cleaning kit is complete and I’m loving the finished product! 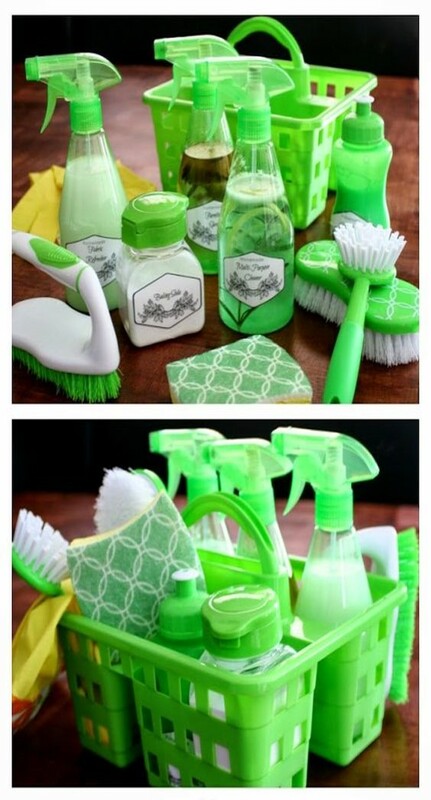 This was a cheap project that left me with a super cute cleaning kit that will bring me joy everything time I use it. With that, I’m off to clean! 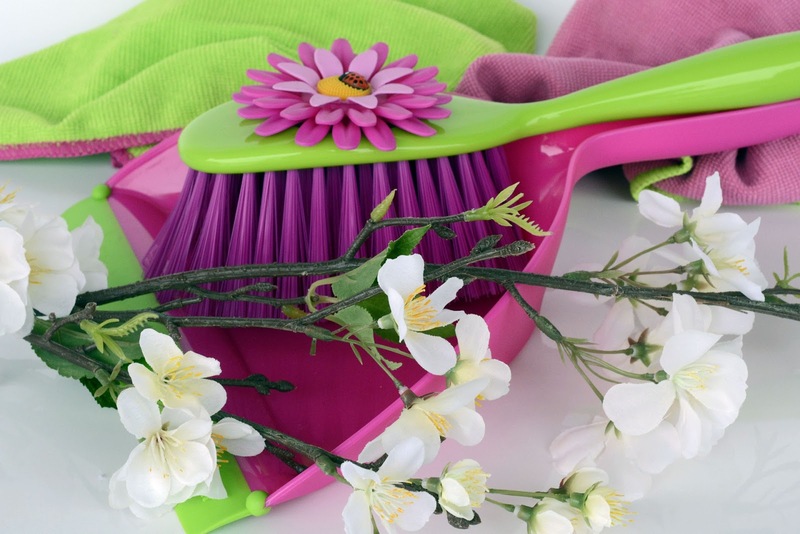 What’s your favorite spring cleaning tip? It’s March, the month of spring. 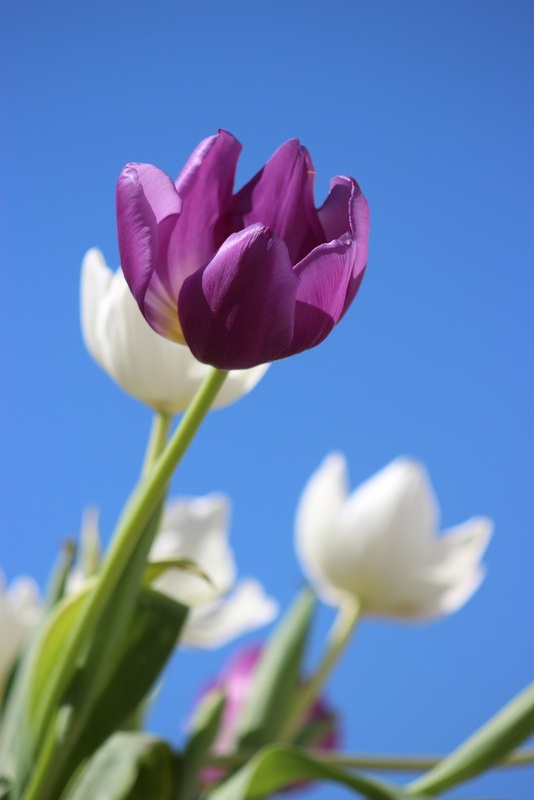 With spring comes warm weather, beautiful flowers, green grass, birds chirping, and spring cleaning. How glorious those sound, until we get to the cleaning part. 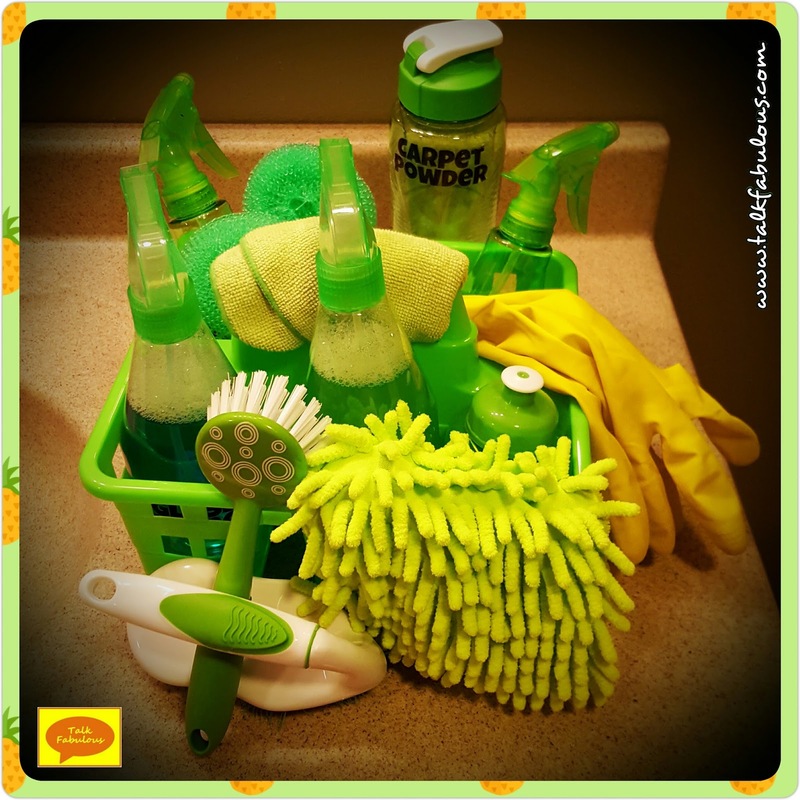 To commemorate this time-honored tradition, this month’s Fabulous Finds Fridays will be all about cleaning. Today, let’s talk about how to simplify the cleaning process so we can spend more time outside and less time inside. I’m not fond of cleaning, AT ALL. I have a terrible habit of putting it off and putting it off until it all piles up into a Saturday full of chores. I don’t know about you, but that’s not how I want to spend my Saturday. Knowing that I needed some help getting out of this cycle of craziness, I took to the App store. There’s gotta be an app for that, right? Lo and behold, there are apps to help you get organized with your cleaning. One particular app caught my eye and it’s called FlyLady. I first heard about FlyLady about 10 years ago from a co-worker. She had just had her first child, her husband was in vet school, and she worked full-time. She was a busy mama! She started using FlyLady with really great results. I figured an internet brand that had that kind of staying power must be good, so I downloaded the app (you can find it on the iOS or Google Play Store by searching for FlyHelper). FlyLady also has a website with the same information here. So, what is FlyLady, you ask. 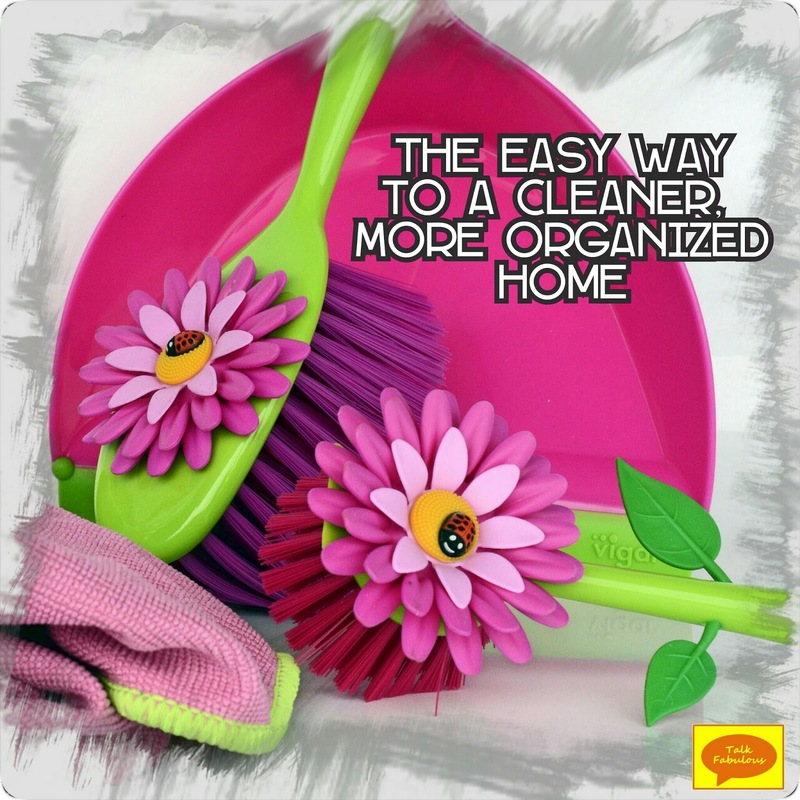 Basically, it’s a system designed to help you easily get organized, reduce clutter, and establish routines to clean your home. FlyLady is big on doing little things to make life easier and more enjoyable. Primarily, I use the app as it’s super convenient having the information I need right on my phone. The information on the app corresponds to the Launch Pad on the website. There’s tons of wonderful information on the website too, and I would recommend checking it out. Today, though, I’ll just be talking about the app and the Launch Pad. When you open the app you’re greeted by 6 buttons: Routines, Tasks, Zones, Day Plan, Meal Planner, and Timer. Let’s quickly touch on each category to give you an idea of what this is all about. Routines is pretty self-explanatory. FlyLady devises a morning, afternoon, evening, weekly, and monthly routine for us. I find this quite helpful. In the app, this is completely customizable. You can easily add or delete items to fit your needs. I would recommend not deleting any task until you’ve tried it for at least a week. You might be surprised by the result. Clearly, I’m speaking from experience. 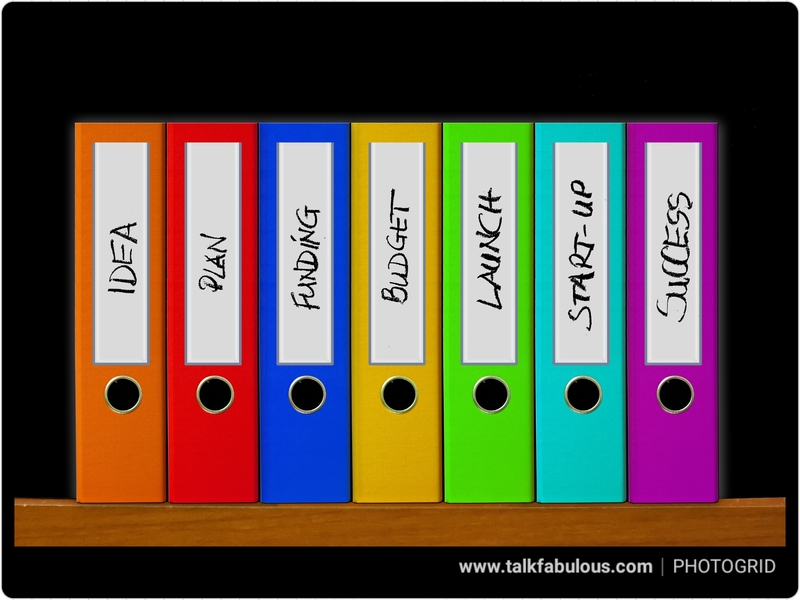 😉 Tasks give you a spot to write down your own to-dos. This is where things go that I’ve been putting off. Zones is an especially useful area. FlyLady breaks your home into several zones and assigns tasks to each of them. Every week, we tackle a different zone. The Day Plan is also very useful. All the information we need for the day is listed here including our daily routines, which zone we’re on, and much, much more. The Meal Planner I haven’t used much yet, but this could be a great way to plan meals. Finally, the timer is just that, a timer. This comes in pretty handy at times. Now you might be asking, “Missy Ann, this is all fine and good, but why should I use this system?” FlyLady stands out from the others because it’s easy and doable. Open the app and you could start with something right now. It’s all about baby steps with FlyLady. She reminds us our homes didn’t get messy overnight and they’re not going to get clean overnight either. She suggests a timer for usually 15 minutes per task, then moving on to something else. That way we’re not spending half our Saturday cleaning. As I mentioned earlier, she’s also big into doing little things to make life better. For instance, making your bed in the morning. I’ve never been one to make my bed; it’s just going to get messed up later. However, when I started making the bed, you wouldn’t believe the positive effect that had on my psyche. 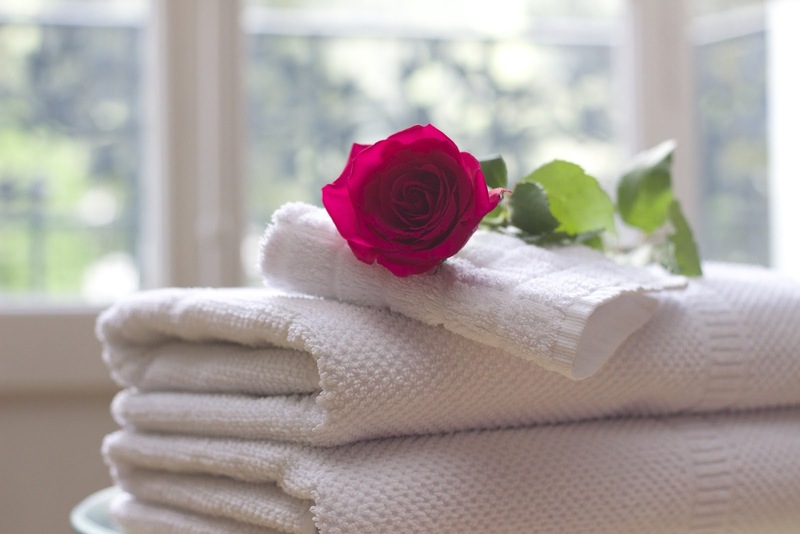 The rest of your room could be a complete disaster, but if your bed’s made, everything seems clean and you’re happier. I just barely scratched the surface here. FlyLady truly has something for everyone. I highly, highly recommend checking it out. You won’t be disappointed! This was a long post. Thanks for hanging in there! Have you tried FlyLady or another system? Let me know about your experience in the comments below or on the Facebook page.